Taking tartiness to the next level, but also extremely useful for those overnight sessions. 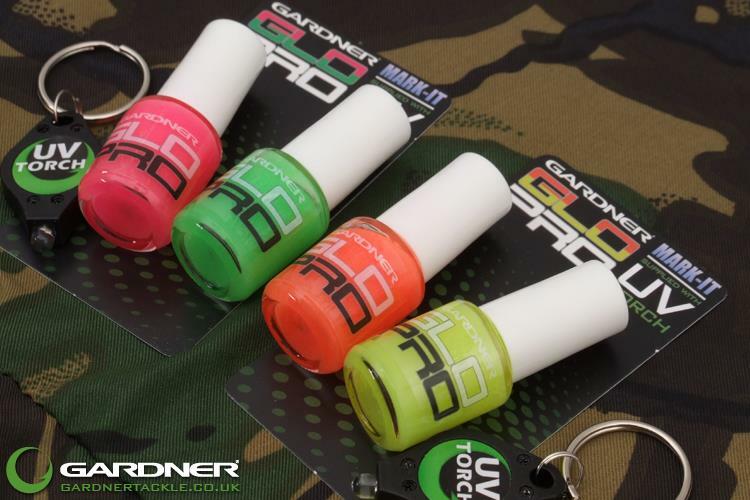 Gardner released their 'Glo Pro' range, a nifty glo-in-the-dark line marker. Clipping up at night just got way easier! ‘Glo Pro’ is a luminous liquid line marker that is supplied in 4 hi-viz colours that glow for 10 minutes after being charged with a UV torch or powerful LED head torch. This luminescence makes ‘Glo Pro’ easy and convenient if you’re marking distances on your mainline for clipping to a specific range especially at night. Whether you prefer to cast out to a line marker, wrap up on sticks or walk your lines out ‘Glo Pro’ makes this quicker and easier. As ‘Glo Pro’ is painted onto the mainline and forms a tidy tapered coloured marker that doesn’t snag or snare in the rings during casting, and will not slip whilst playing a fish. It’s rubbery/flexible texture means that it is easily removed with your fingernail and doesn’t mark or damage your mainline.